Bok Bar does not take reservations. Bok Bar does not allow any outside food or beverage. Bok Bar is a smoke-free establishment. Bok Bar allows birthday cakes for a $25 fee. Please check in with a host or security guard upon arrival. On Monday and Tuesday only the bar is available for private hire. For more information please contact us here. Please click here for Press. 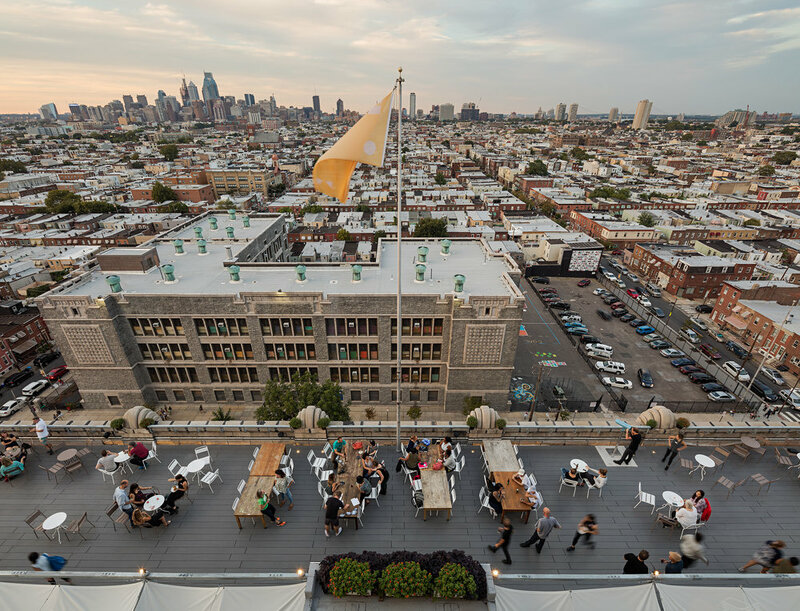 The Bok Bar is a seasonal rooftop bar located atop the historic BOK building in South Philadelphia. We are a 21+ bar with the exception of Sunday's when dogs and children are welcome. All other evenings babies under 6 months of age and physically attached to a person can also join. If possible please use an alternative form of transport - bikes, walking and public transport are highly encouraged! There is plenty of bike parking available. Bok is an Indego Bike Share location. The bar entrance is on Mifflin Street closest to 8th Street. A dedicated uber / taxi pull-off lane is located here. entering and leaving Bok Bar. Questions, comments, or accolades? Give us a shout! friendly reminder we don't take reservations, so please don't request them here. cheers! I'm not a bot, promise. Thank you for contacting us at Bok Bar! We will respond to your inquiry as soon as possible. We don’t take reservations; the bar, like our panorama, is open to all. This goes for groups of any size for any reason - we just don’t do it! Please note we might not respond to your inquiry regarding reservations due to volume. Just come on by! Bok Bar is available for your private soirees and melees on Mondays and Tuesdays only. No exceptions! hand-cut fries with tomato toum sauce. chicken thigh pieces fried with za’atar spices with garlic toum sauce. We don't take reservations; the bar, like our panorama, is open to all. This goes for groups of any size for any reason - we just don't do it! We generally don't respond to inquiries about reservations due to the volume of messages. Just come on by! Bok Bar is available for your private soirees and melees on Mondays and Tuesdays only. Interested in renting Bok Bar on a Monday or Tuesday or in doing a photo or film shoot at Bok Bar? Visit buildingbok.com/events and fill out the form. Someone will get back to you shortly. Please keep your babies at home unless they're still attached to you, whether it be via umbilical or sling (sling limit is 6 months old or younger). If it is not a Sunday during Family Day hours, we do not make exceptions to the 21+ rule. Please and thank you! But on Sundays babies and dogs are welcome, and we all know there's nothing better than babies or dogs except babies and dogs.